Pádraic Fleming is a PhD scholar on the prestigious HRB-funded SPHeRE (Structured Population Health Services Research Education) doctoral programme. Padraic joined the Centre in 2013 to undertake an evaluation of the development and implementation of ‘individualised funding’ initiatives for people with a disability. His doctoral work, which is funded by Genio (www.genio.ie), is supervised by Professor Sinead McGilloway (Centre Director)and Dr. Sarah Barry (Trinity College Dublin). Prior to commencing his PhD, Pádraic worked in health and social research for almost 10 years since graduating with an M.Sc. in Applied Social Research from Trinity College Dublin. During that time, Pádraic was awarded a position on the Irish Aid overseas development programme where he worked as United Nations intern with the World Health Organization in Vietnam (2006) based in the Hanoi School of Public Health. He published work spanning projects related to Employment Guidance Services for people with disabilities as well as various research projects undertaken during his time as Research Officer in the Programme Evaluation Unit of the National Cancer Screening Service in Ireland. In 2014, Padraic was awarded a prestigious Young Forum Gastein Scholarship for the European Health Forum Gastein (EHFG) 2014, offering a unique opportunity to learn about current developments in Europe and to network with a number of high-level experts in the sphere of health. More recently, in 2017, he was appointed to a national Task Force on personalised budgets for people with disabilities. 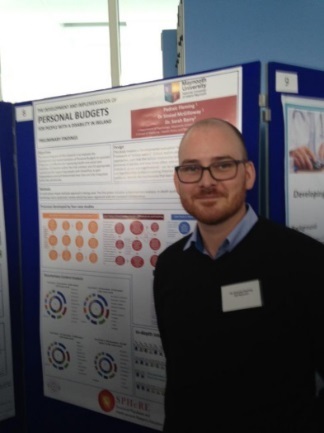 Pádraic’s current research is investigating if individualised funding initiatives are: effective for improving health and social care outcomes; feasible within the Irish context; and, an appropriate mechanism for supporting people with disabilities to gain more choice and control over their lives; independence; and self-determined lives that are fully integrated within the community. As part of this work, Pádraic has conducted a 15-year trend mapping exercise of traditional day services for people with intellectual disabilities in Ireland. This offers important insights into how emergent trends can inform future direction of disability services, offering internationally relevant recommendations. In parallel, Pádraic has conducted an in-depth qualitative evaluation of four pilot initiatives in Ireland, including a documentary analysis, in-depth interviews and a participatory workshop to present initial findings to research participants and other key stakeholders. Pádraic is also working on a Campbell Collaboration systematic review to determine if international evidence indicates whether individualised funding is effective at improving a range of health and social care outcomes for people with a disability. Both the Title Registration Form for this work plus the detailed study protocol are available from the Campbell collaboration website (www.campbellcollaboration.org). Please see also our section on Systematic Reviews below.